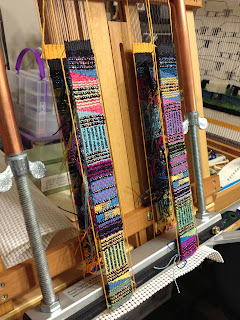 I have been weaving. 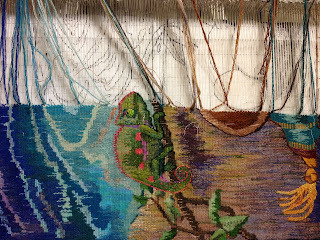 The tapestry bead trim, all 44 inches of it, is off the loom. A bracelet made like this goes pretty quick but this was the equivalent of six to eight bracelets and took some time to do. I was also motivated by needing to have it off the loom before the workshop with Tommye Scanlin at Arrowmont. 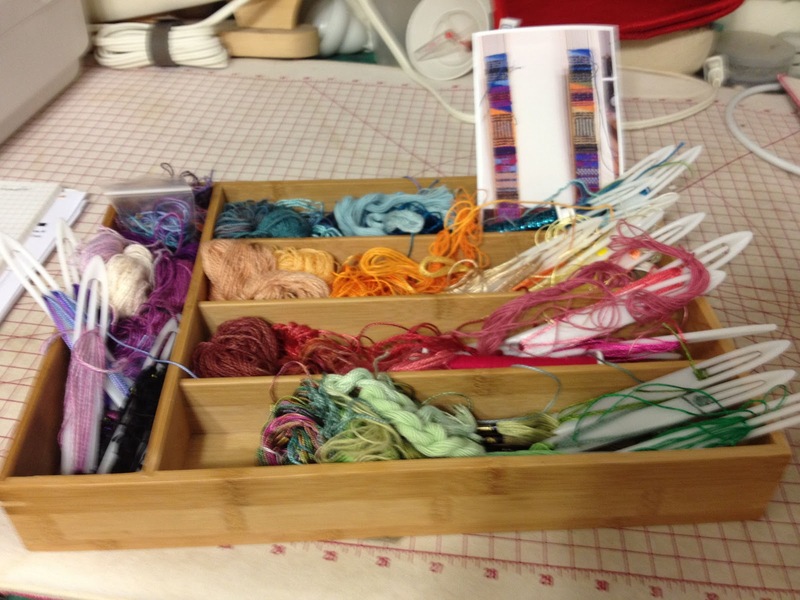 I made a picture right before I cut it off the loom. Here it is after a little trimming with some other elements that will be part of the fancy bag I am making. 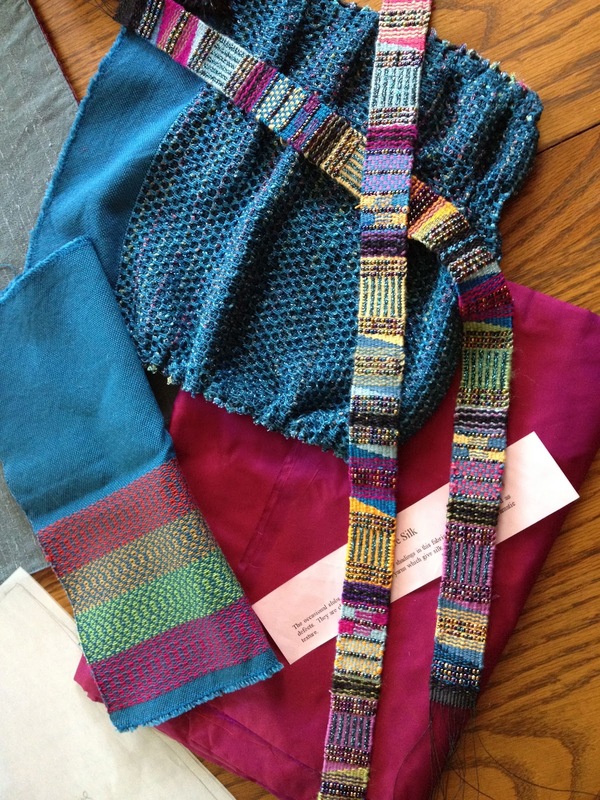 We often talk about the downside of stash: how to store it and how to organize it so that it can be found when needed but isn't it wonderful to be able to pull a lovely piece of silk in coordinating color out of the collection and have some colorful threads all ready to go when inspiration strikes! Here is a picture of some of the threads I used in the Tapestry Bead Trim. Notice the photo in the photo. I took a picture of how the weaving looked on the loom so that after I advanced the warp I could remember which colors and patterns had already been woven. It helped to have it as reference as I was selecting colors for the remainder of the trim. 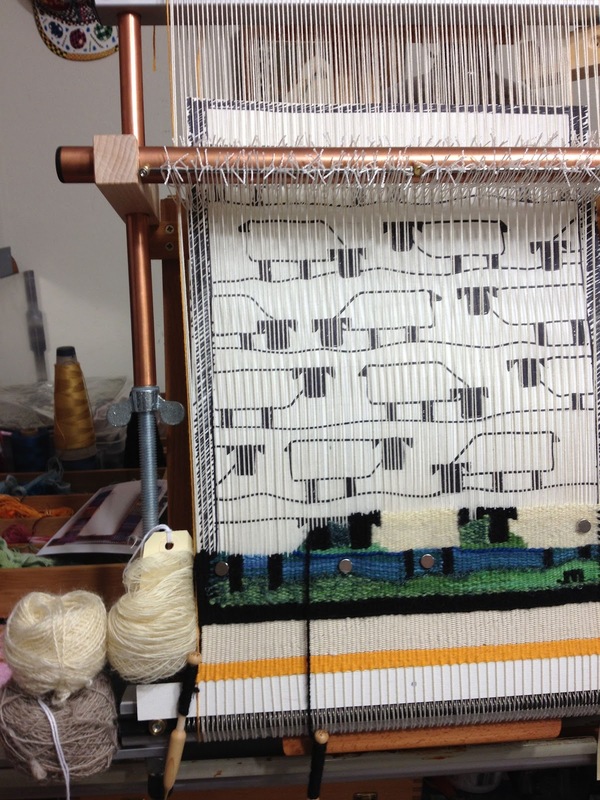 The Tapestry Breeds and Preps sampler is coming along also. Here it is with the Romney samples woven and the next in line are Navaho Churro and Cotswald. With all the smaller projects I am now itching to get back to The Mango Hunters. Getting ready for the class on June 24 is top priority right now but I should be having some progress on it soon. It looks like this right now. 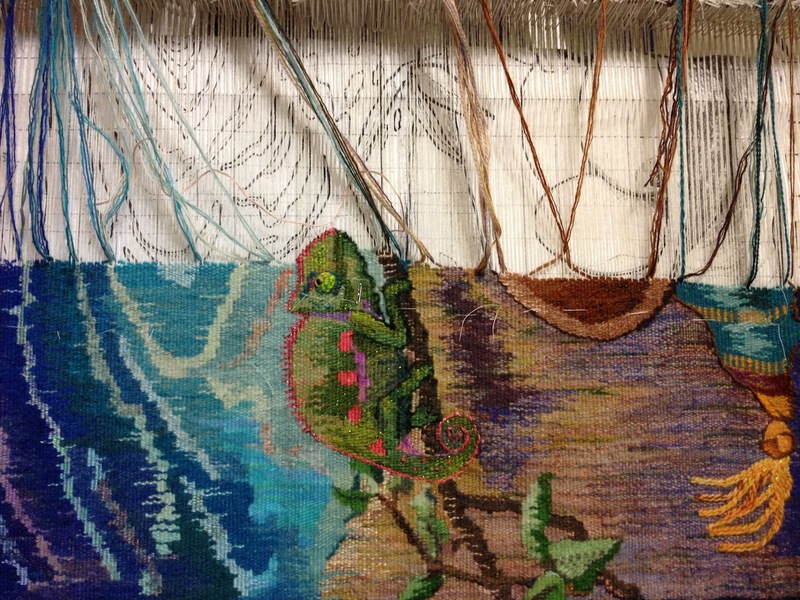 Those chameleons are charming creatures and when I work on this piece I am transported to the world within it. 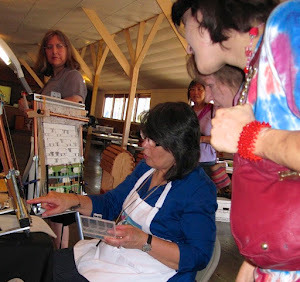 What wonderful work you are doing - Arrowmont will be so fun for you. Sort of like a weaver's trip to paradise. Thanks so much Lyn. Between getting ready for the trip to Arrowmont and waiting for the new grandchild there is never a dull moment in my thoughts these days! Mmmmm! All of your work is absolutely gorgeous, Janette! Thanks Noreen, it is especially nice to have a compliment from someone whose work I admire.